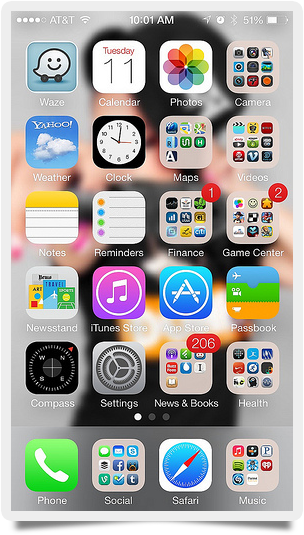 When Apple released its iOS 7 update, users were introduced to a cleaner design and plenty of new features. Here’s our list of five features that should convince you to take the leap and finally get the iOS 7 update. Perhaps one of the best features to come with the iOS 7 update is Control Center, which allows you to easily gain access to the settings that you use frequently. It used to be that you had to go through several steps to make changes to your WiFi or screen settings; now, with just one motion (swiping up from the bottom of the screen), you can access Control Center to enable Bluetooth or adjust brightness. Ever wanted to know the exact time you sent a text message to someone? With previous versions of iOS, you weren’t able to see time stamps. With iOS 7, all you have to do is go to a conversation and swipe left to see a time stamp for all messages. The new Camera app for iOS 7 has many new features, including the ability to add filters to your images (available for iPhone 4s or later) or take your pictures in square format, which means your images will be ready to post on Instagram in a snap. You might already be familiar with music services such as Pandora or Spotify. iTunes Radio is Apple’s foray into the ranks of online streaming music. iTunes Radio is a nice addition because it’s integrated in iOS 7, so there is no need to install an additional app. Also, it uses your iTunes purchase history to help you curate your own stations. Keep in mind that iTunes radio is free to listen to, but it does have ads, and — similar to other music apps — there is a limit on the number of songs you can skip. Another great feature of iOS 7 is having a way to block phone numbers on your phone. There are various ways to block numbers. One is by going to your call log and tapping on the “i” next to the phone number, then selecting the “Block This Caller” selection at the bottom of the screen. However, be aware that once you block a number, the person you are blocking may be clued in that they are blocked. According to a report from Wired, once the blocked person calls you, they will hear a few rings followed by a busy signal. But if you don’t care about that, then block away and say goodbye to those pesky calls.